Come one, come all, come big, come small…to behold the spectacle of butchery and observe the artistry of the blade practiced in front of your very eyes! 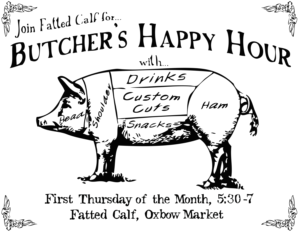 Come in to congregate in front of the meat case at The Fatted Calf on the first Thursday of every month and taste local brews and wines, sample a selection of meaty treats, and cherry pick the perfect cut of pastured perfection while watching a few beasts be expertly butchered. All that and the show for…free!